A long-standing stigma attached to taking leftovers home has hindered British and European diners from tackling waste reduction at the restaurant table. Three new movements have sprung up in the UK, Sweden, and Italy to promote the benefits of taking home leftovers, signaling a shift in opinion towards the doggy bag in Europe. 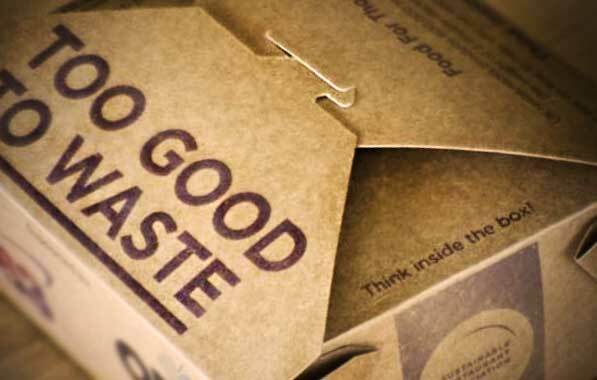 The UK’s Sustainable Restaurant Association (SRA), in conjunction with 3663 and One Water, launched its Too Good To Waste campaign in 2011 with the goal of changing the negative associations with asking for a doggy box (to-go box) to take home leftovers. A recent survey of UK diners revealed that people did not ask for doggy boxes because they were either too embarrassed to do so or they thought that restaurants were not legally permitted to provide them. A 2010 food waste survey discovered that an average restaurant in the UK disposes 21 tonnes of food a year—nearly the weight of three double-decker busses—30% of which comes from the leftovers on diners’ plates. The survey found that 75% of customers were unaware of the scale of the problem of food waste. However, when presented with the facts, 90% stated that something had to be done. The Too Good To Waste campaign seeks to alleviate the environmental burden of greenhouse gasses that come from landfill waste, to allow restaurants to benefit from the £150 – £1,700 reduction of waste collection costs (roughly USD $232 – $2,645), and to benefit the customer, who will enjoy their meal to its fullest. We’re back in austere times now, people don’t have a lot of money at the moment. If you are eating out you’ve paid for your meal, you’ve enjoyed it, maybe your eyes were a bit bigger than your belly and why not take that food home? In order to further promote the use of doggy boxes, the Too Good To Waste website allows diners to submit their favorite leftover recipes as well as suggest restaurants they would like to see provide doggy boxes. To kick start this new to-go box trend, the campaign gave out 25,000 doggy boxes to its participating restaurants. Made from 100% recycled and biodegradable materials, the boxes allowed the customer to either recycle or compost them after use. In Sweden, a campaign called Släng Inte Maten (Do Not Throw Away Your Food)—organized by the Swedish consumer association Konsumentföreningen Stockholm (KFS)—has taken on a similar endeavor to educate the public on the effects of waste, and to promote the use of the doggy bag. KFS has held seminars for both diners and those in the food industry to educate on waste reduction, created a consumer guide with waste reduction tips, and conducted a series of diner attitude surveys and measurements of food waste. Like the British, and many other European countries, there is a social stigma attached to the doggy bag in Sweden. An attitude survey conducted in 2011 by KFS found that 46% of the Swedish population feel that asking for a doggy bag is embarrassing and that half of these people thought that carrying a doggy bag home was impractical or inconvenient. Moreover, 60% of Swedish people do not equate food left on their plate with negative environmental impact, nor do they make the connection between saving one’s leftovers and waste reduction. When diners do consider the food left over on their plates, most think in terms of guilt over those who go without food, e.g. starving children in Africa, or the homeless. What most people do not consider is the environmental impact–not only of leftovers that end up in a landfill–but also the resources that went into cultivating that uneaten food: the water, fertilizer, man power, and unthinkable amounts of fuel that brought the food from farm to plate. KFS has also launched a series of short videos to try to change this negative view on taking leftovers home. Swedish rapper Dogge Doggelito, from one of Sweden’s first rap groups, The Latin Kings, took part in one of KFS’s video campaigns. In the video, Doggelito is at a restaurant and overhears a couple arguing. The man sits embarrassed as his wife approaches Doggelito for what he presumes to be an autograph request. However, it turns out what she really covets is his doggy bag. The introduction of the doggy bag in a society that rarely deviates from the sanctity of its long established dining traditions is sure to be a challenge. 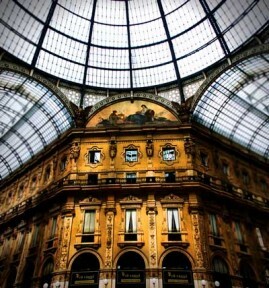 However, one organization is sowing the seeds of change in Milan. Cena dell Amicizia is a non-profit that provides homeless relief, and education to the public on the issues of homelessness. Funded and sponsored by Milan’s Department of Health, Cena dell Amicizia has started a campaign called Il Buono Che Avanza (The Good That Advances), which promotes social acceptance for doggy bags, encouraging fashionable Milanese diners to take both food and wine leftovers home. Unlike other campaigns that advocate the usage of doggy bags, Il Buono Che Avanza’s focus is on social, rather than environmental responsibility. The purpose of the campaign is to move Milanese culture away from a “society of waste” which throws things away without care or acknowledgment of those who have very little. At its heart, the campaign is an extension of Cena dell Amicizia’s homeless relief efforts, spreading awareness of the issues of homelessness in Milan by connecting them to a culture of needless waste. A good example of how awareness of this issue has been effective can be seen in California’s San Francisco Bay Area, where it is common for people to take their leftover food to-go–not because they want to eat it later, but rather with the express intent of giving it to the homeless on the street as they leave the restaurant. In districts where homeless often congregate, such as the famous Haight Ashbury, it is increasingly common for the homeless to ask diners leaving restaurants for their doggy bags rather than spare change. When viewed from this perspective, the remains on your plate–that untouched slice of bread, the curry you just couldn’t finish–suddenly do appear too good to waste.